This hour, we hear from University of Illinois wheelchair athlete Tatyana McFadden about her Chicago Marathon win this past weekend. 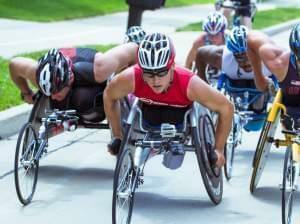 Jim Meadows also talks with IntelliWheels’ Marissa Siebel and Josh George, who took third place in the men’s wheelchair division of the Chicago Marathon, about their Champaign based company that makes geared wheelchair wheels. Ryan Chalmers is attempting to push himself across the country from Los Angeles to New York in 71 days…in a wheelchair. This hour on Focus, we talk with Chalmers about why he’s doing it and how it’s going. An estimated one out of every five Americans has been diagnosed with one or more psychological or physical disabilities. That makes disabled Americans one of our largest minorities. And yet, most of our history books pay little notice to the role the disabled have played in our nation’s past. We’ll discuss the contributions of the disabled to our laws, policies, economics, popular culture, and collective identity, with Kim Nielsen, author of A Disability History of the United States. Around the world there are countless people with neurological disorders that disrupt their ability to move or communicate. Injury or disease can create a gap between a functioning brain and the parts of the body meant to receive its signals. Today on Focus, we'll look at the effort to develop medical devices to bridge that gap with guest Victor D. Chase, author of Shattered Nerves.